Dang. It doesn't get any cooler than this, folks. Boasting a ridiculously large 400mm fan on the side panel, the Aerocool S9 Pro Computer Case has the ability to deliver more than 250CFM of airflow. That's right, this high-performance enclosure comes with one of the biggest case side panels IN THE WORLD, and believe us, you can tell. In addition, a 120mm Quad Blue LED Fan is included on the front panel for an extra dose of style and cooling performance. Enhancing the optimal air flow is the addition of 9 metal mesh bay covers, giving the Aerocool S9 even more room to breathe. Offering tool-free installation for CD-ROM, tool-free designs for 5.25 and 3.5" bays, and sufficient depth to install a high-quality PSU, the Aerocool S9 Pro Computer Case provides the users with plenty of ways to get their mod on. In addition, the S9 case also features over 7 PCI expansion slots, HDD with vibration proof adapters, and extra fan space for an 80mm, 92mm, or 120mm fan. 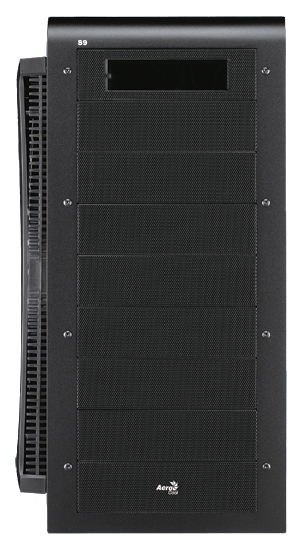 Material: SECC 0.6mm Dimensions: 17.5" x 17 x 8"
Side Panel: 1 x 400mm Side Fan Drive Bays: 9 x Ext. 5.25" / 1 x 5.25" < 3.5"